We welcome you all to the Group-Buy of Ranga Majestic Model. Majestic is a new model of Ranga Pens. It is approx 175 mm in length and the barrel dia of the pen is 17 mm and dia of the cap is 18.75mm. The pen is available only in Gold colour finish clip along with gold colour trims. It would be EDC and Treasure for Giant Size Pen lovers .Though it is Giant , It is absolutely comfortable pen for long writing sessions. For this Group Buy, Regular series and Special Series Ebonite are available in both Polished and Brushed Finish. We have limited nos. of these pens in stock and the pen will be shipped immediately after payment within 1 week. For shipping within India Kindly PM for the prices and how to make payment. Looks great. Thank you Mr. Kandan for yet another opportunity to acquire your pens. Are titanium nibs available? if so what nib sizes? Also, in your first post above, right under the "attached images" there is an image of what looks like a dark blue/gold or a black/gold Pen...Is that available and if so what # is the color combination? I don't see it listed anywhere. Titanium nibs are not available. I think you are referring #21 and #24. #24 is available in Matte finish only. Here is the Pen/colors I am referring to....it is clearly not #21(solid teal-blue/green) or #24 (Solid gold)...This Pen /color is included in the first post that you placed in this forum...the first image below where it says " attached images"
It looks to me like a Dark Blue/gold or a black/gold... thank-you, Bill P.
Edited by Bill P, 30 March 2018 - 21:57. Can you please let me know the price and shipping method for with in India. I tried sending PM but it said you cannot receive any new message. Kandan, would you post a picture of the Majestic alongside an Emperor and a #5? I prefer the round ends. Thank you. Can you say what the diameter of the section is? Thank you! Flat End; # 6 Steel Nib - Gold Monotone Finish: 1.1; S24 - Solid Golden Brown; Polished. A beautiful giant in my collection. How I wish that there was an option for choosing Jowo nibs! I wonder if Ranga addressed the problem of misaligned cap end. In the pictures this model looks perfectly fine, the body and cap end look seamlessly joined with the main parts. Are you making this into a regular model? I would also love a picture comparing it with other models to get an idea of how big it is. Edited by steve50, 31 March 2018 - 23:51. How much does it weigh Posted and Unposted? 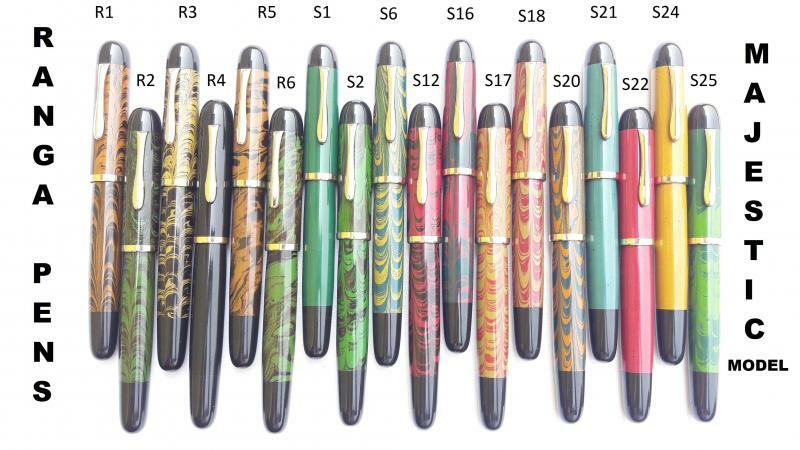 Majestic Model comparison pen picture is posted in our Instagram account. There is no problem of Misaligned Cap. May be 1 out of 1000. Comparison picture is in our Instagram.